1. PVC lay flat hose connection. When the PVC lay flat hose connects with the PVC lay flat hose interface, it must be padded with a soft protective layer, and then tightened with galvanized wire or throat hoop. 2. The use of PVC lay flat hose. When using PVC lay flat hose, the high-pressure resistant PVC lay flat hose should be connected near the pump. After filling, the PVC lay flat hose should prevent torsion or sudden bending, and the collision damage of the PVC lay flat hose interface should be prevented. 3. PVC lay flat hose paving. When laying PVC lay flat hose, it is necessary to avoid sharp objects and various oils. When laying PVC lay flat hose vertically to high places, it is necessary to use PVC lay flat hose hooks. When laying PVC lay flat hose through main roads, it should be padded with PVC lay flat hose guard bridge. 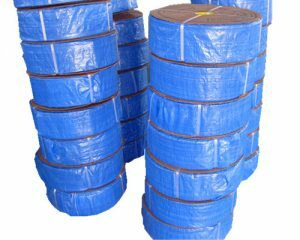 When passing through railways, PVC lay flat hose should pass under railways, so as to avoid the damage of PVC lay flat hose by wheels and intermittent water supply. 4. Prevent icing. In severe winter, when water supply needs to be suspended in the fire site, in order to prevent the freezing of PVC lay flat hose, the pump needs to run slowly and maintain a small amount of water output. 5, PVC lay flat hose cleaning, PVC lay flat hose after use, to be cleaned, for the transport of foam PVC lay flat flat, we must carefully wash, protect the glue layer. In order to remove grease from PVC lay flat hose, it can be washed with warm water or soap. For frozen PVC lay flat hose, melt it first, and then clean and dry the PVC lay flat hose without drying. It should not be rolled up and stored. The previous article：How do you know the service life of PVC lay flat hose?